Bring an ornate hint to two of your doors with these Esschert Design Brown Cast Iron Scroll Doorbells. The timeless shape, traditional colors, and hardy construction of these bells create classic adornments, for a wonderful bit of style at your front and back door. The 8" tall, cast iron brackets attach to a wall in moments, and each handily supports an arched arm with scrollwork and bell. The 4.25" diameter bells each have a cast iron clapper and rope pull, allowing your guests to notify you of their arrival. Black tones on both the bells and hangers add a distressed look, while the white of the rope lends a bit of contrast to the units. The brackets affix to a wall in moments using screws (not included), and the cast iron construction provides plenty of durability. Add a traditional and decorative bell to both your front and back door with these Brown Cast Iron Scroll Doorbells. Some assembly required. 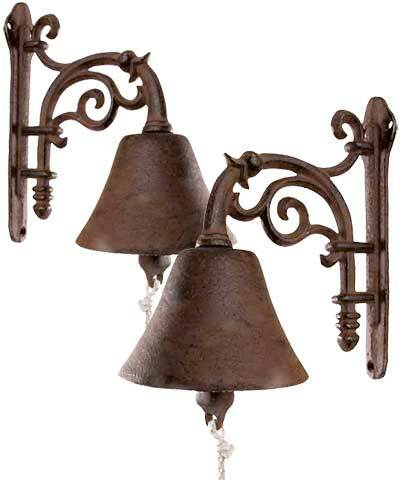 Note: This package contains 2 of the Esschert Design Cast Iron Scroll Doorbells, Brown.